We are pleased to announce that FloWorks 2.0 for FlexSim 7.7 has been released. This powerful module for modeling and optimizing flows in a (logistics) network is now also available to install through the FlexSim on-line content menu. FloWorks is a powerful additional module for FlexSim simulation software used to accurately analyze and optimize the logistics of bulk, fluids or gas flows in a network. FloWorks is a radical new approach to combine discrete events and continuous processes to an ‘event driven continuous calculation’. The approach consists of modeling continuous processes as a network of flows. 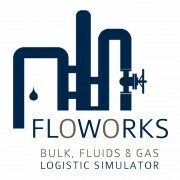 FloWorks is used in supply chain modeling, chemical plants, food production or any other industry involving logistics of bulk, fluids or gas flows. If you have FlexSim account, you can find the FloWorks module in the section: “3rd Party Modules”.